Aside from managing a collection of over one million specimens and providing botanical expertise, the State Herbarium of South Australia seeks to inspire new generations of botanists to pursue a career in that field. For a select number of university undergraduates, the Herbarium provides opportunities to gain first-hand experience in the Herbarium’s work, whether it be in specimen curation or taxonomic research. 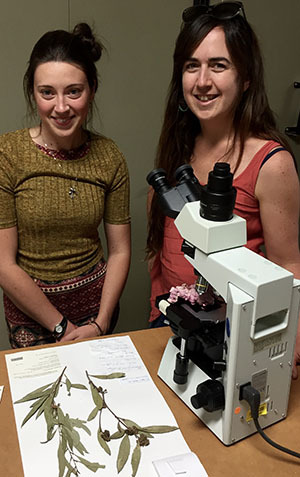 The Herbarium has been doing this through a program of summer scholarships where some of the most promising students are offered the opportunity to enhance their skills and knowledge and gain first-hand career experience. Two students, Jessica Burdon and Sarah Harvey from the University of Adelaide School of Biological Sciences, were offered this opportunity over the summer break. Jessica had already commenced volunteering with the Herbarium to assist with a project to photograph exemplar specimens of the South Australian vascular flora. These high resolution images will support electronic flora descriptions and other applications enhancing the availability of knowledge of the State’s flora. During her internship, she has also been involved with the Carpobrotus project currently being run by Herbarium staff. 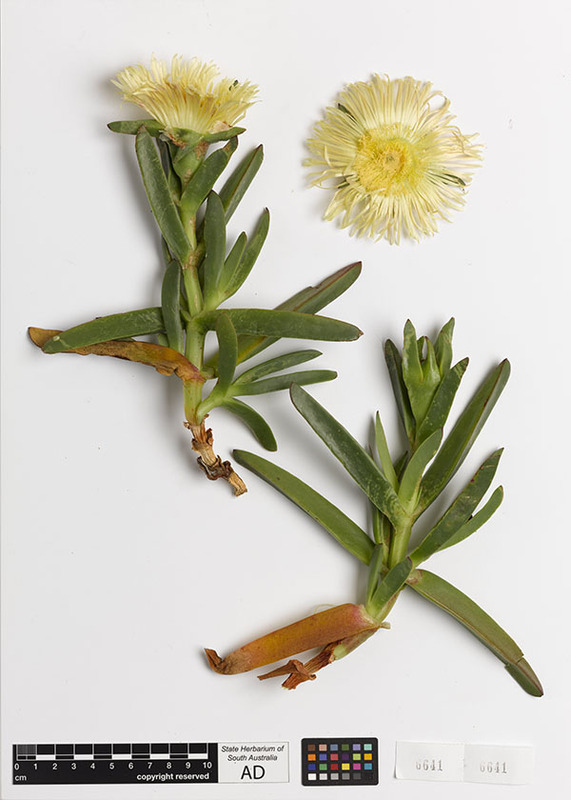 This project, being carried out in collaboration with the Adelaide and Mt Lofty Ranges Natural Resource Management Region and Birdlife Australia is conducting surveys and research into the level of invasion of a weedy hybrid of the coastal succulent plant pigface. Her work has included supporting the curation of incoming specimens and extraction of seeds for investigation and cultivation. Jessica will also learn techniques for seed photography, microscopy and data capture associated with the use of taxonomic information, and how to apply all this knowledge to on the ground decision making and management. Sarah has been involved with the Adelaide Fungal Studies Group, organised by Honorary Research Associate Pam Catcheside. Her internship roles have included two main projects. The first is assisting Technical Officer Carolyn Ricci with a problem involving the group of red algae that contain carageenans, compounds highly valued, for example, for use as thickening agents in ice-creams. The dried specimens of this group gradually break down owing to specific chemical processes which occur after preservation. As a result the specimen sheets have been discovered to degrade in such a way that they ‘melt’ forming an unstable mess and emitting a sulphurous compound that degrades the plant and paper and most things in contact with it. The work in handling these specimens involves initially making high quality photographs of the specimens and then beginning some curatorial ‘rescue’ activities. The images of what remains of the current specimens will act as a record of the specimen before they completely self-destruct. These images will able to be incorporated into the specimen record in the new Herbarium data system, which is currently being developed. Two specimens of ‘melting algae’. The left specimen is deteriorated black on both ends, with a red intact section between. 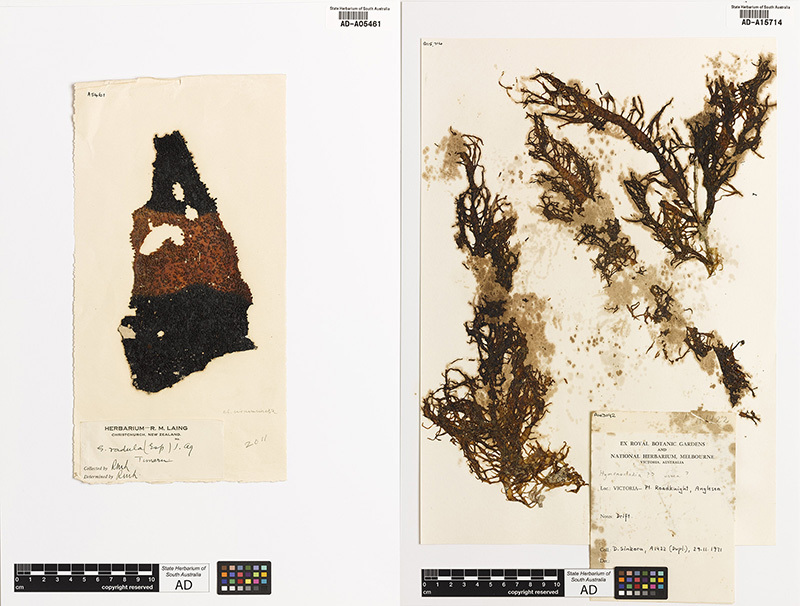 The right specimen is badly damaged, even though it was collected relatively recently, in 1971. Sarah’s second project has been to assist Senior Botanist Graham Bell with a small project documenting the occurrence and taxonomy of an introduced liverwort, Sphaerocarpos, in South Australia. Whilst the presence of this liverwort in Australia was officially published in 1980, little work on its distribution has been undertaken and very few specimens are held in Australian herbaria. Graham first found the species in the State in 1989 and has since collected a number of specimens, amongst which he has identified a second species, not yet recorded for Australia. 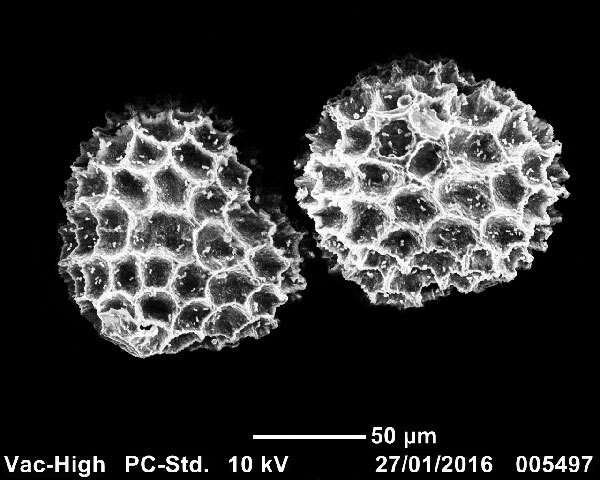 As the species can only be separated accurately by examination of the spores, slides of spores have been prepared from all specimens and these have are being examined by light microscopy and scanning electron microscopy (SEM) to verify surface features. Both students have been working with a high degree of professionalism and skill and have been a welcome addition to the summer work of the Herbarium. This entry was posted in News on 1 March, 2016 by Jürgen.